Six teenage dancers have one year to prove they've got what it takes after winning a place at the National Academy of Dance. The events in the show are primarily seen from the perspective of Tara Webster, a new student at the National Academy of Dance. She, along with fellow students Katrina Karamakov, Ethan Karamakov, Samuel Lieberman, Abigail Armstrong and Christian Reed, will learn the ins and outs of ballet. Series two will see Tara return to the Academy for her second year and the hope of representing Australia in the international ballet competition "Prix de Fonteyn". 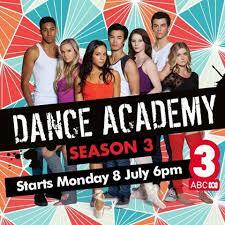 This series will introduce characters Grace Whitney and Ben Tickle, as well as a new teacher, Saskia Duncan. It's three weeks into third year and Tara and her friends are already feeling the pressure. Speculation bubbles when the National Ballet Company announces it needs three temporary fill-in roles in the corps de ballet. Instead of remaining focused, Tara jeopardises her preparation for this audition when she tries to organise a surprise birthday party for Abigail. Meanwhile, Christian is mysteriously absent and no one knows if he'll return to the Academy; Ollie's been allowed to repeat third year; Grace continues her training at the Academy, but her relationship with the others is strained; and Kat attempts to fast track into third year.